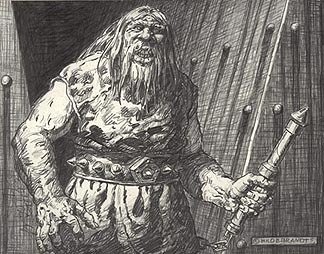 Thog the Turnkey, from the New York Times selling best novel Urshurak published in 1979, illustrated by Greg and Tim Hildebrandt. Written by Greg Hildebrandt, Tim Hildebrandt and Jerry Nichols. This is a finished published piece created by Greg and Tim for their fantasy novel, URSHURAK. Thog is one of the great villains in the story. He leads the quest to save Cryslandon. FRAMED SIZE: 21.5" x 18"